So beautiful and graceful, this premium bouquet brings the charm of one of the world's most famous gardens into the home. 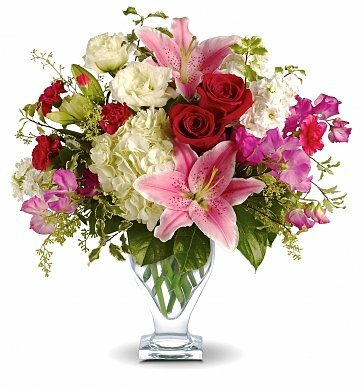 Freshly cut blooms overflow from a lovely glass vase, and include garden-fresh favorites such as Oriental lilies, red roses, sweet pea, miniature carnations, hydrangea, stock, and more. Measures approximately 16" x 22". Kensington Gardens is a hand delivered gift. These gifts are delivered by one of our local design centers located throughout the United States and Canada. Same day delivery is available for most gifts when ordered before the cutoff time. The cutoff time for Kensington Gardens is 2 PM in the recipient's time zone. I was very happy with this arrangement. Everything about it was beautiful. Thanks...the flowers were lovely and delivered on time with no problems. Really appreciate your service. My granddaughter was extremely happy with her gift. Thank You!